URBANA – This year, there are an alarming number of cases of death or decline of eastern white pine, according to University of Illinois plant clinic diagnostic outreach specialist Stephanie Porter. She said that many of these problems are a result of drought conditions across Illinois. Eastern white pine is best grown in an area with moist, well-drained soils and plenty of light, but it will tolerate some shade. It can be susceptible to heavy winds, and branches can be lost during storms, but is resistant to pollutants such as ozone, sulfur dioxide, and salts. The eastern white pine is one of the first trees to show decline symptoms when under stress. According to Jay Hayek, U of I Extension forestry specialist, "Even though eastern white pine is native to Illinois, this species is endemic only to the northern parts of the state, where it grows on coarse textured soils with relatively low soil pH. Eastern white pine grows best on soils with good internal drainage–coarse loamy to fine loamy texture soils–and it is adapted to more acidic soils." Eastern white pines growing in soils that have a high pH may show needle chlorosis, which is yellowing of the needles. Other stresses such as wet or poorly drained sites (clay soils), girdling roots, deep planting or mounded mulch, alkaline soil, flooding (not this year), past hot conditions, and involvement of secondary root-invading fungi, can also cause the tree to be more vulnerable to secondary disease infection and insect infestation. In a year with a normal amount of precipitation, when white pine exhibits symptoms of browning, decline, or death, these symptoms are usually attributed to a problem that has been called "white pine decline," which involves the roots. (For additional information, refer to http://hyg.ipm.illinois.edu/pastpest/200613a.html.) The problems this year, however, are drought-related. Moreover, the associated stress on the trees has made them more susceptible to insects and secondary diseases. 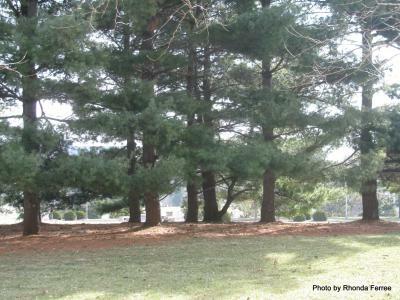 The University of Illinois Plant Clinic has recently received many white pine samples to evaluate. Cytospora canker is one of the diseases they have observed. It is common on spruce, but eastern white pine can also be a host. Its presence is confirmed by the gummy exudate on the branches, especially near the trunk. Canker development is aided by environmental stress and wounding, which allow the Cytospora fungus to invade the tree. Fungicides are not effective against it. The clinic has also heard reports of secondary borers. Often, when homeowners go out to investigate why their pine is declining, they are alarmed when they see borer holes. Many times, these secondary borers are not the main issue, but they attack stressed trees and contribute to their decline. There is no recommended strategy for managing this problem other than to reduce the stress on the tree. Bark beetles are another problem, according to Phil Nixon, a U of I Extension entomologist. A declining tree emits chemical compounds that attract them; they will often attack the healthy trees on either side of the one in decline. In the process, they transmit blue stain fungi to the healthy trees, which can cause those trees to die as well. "In stepwise fashion, the bark beetles and fungi can kill an entire row of trees after several years," he said. He advises prompt removal of the infested tree. Bark beetle adults emerge through pinhead-sized holes from March to October. There are usually three to four generations per year. If the tree shows symptoms of decline between March and October, the healthy trees on either side were probably attacked, and it is a good idea to remove them. Spraying for bark beetles is unlikely to be successful because they emerge at various times through the growing season, and several sprays per year would be needed. Unfortunately, there is little that can be done for the declining trees. If possible, provide water in periods of drought, fertilize with an acidic fertilizer (not during drought), and wait to see whether the tree responds. Identify any insects on the tree to determine whether treatment is recommended. Once the tree dies, remove it and, if possible, the roots to prevent secondary insect problems that could spread to healthy trees.